AVON came out with lots of collection this year and I am pretty excited to try all of their collection that bring your Korean glam game on. You will be exception this AVON collection series from now on and for today collection feature, Fall in Love. Describe as a bold, funky eyelids with red-hot lips, perfect for glam events. 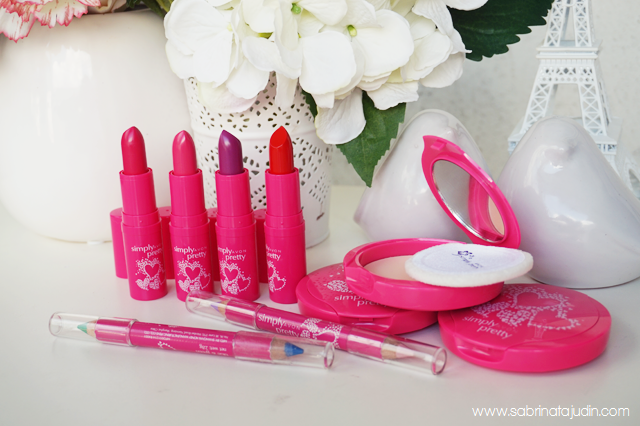 Wow wee~ In this collection it offers you 4 creamy lipstick, two duo end eye pencil and 3 different shade of compact powder to suit your skintone. The Shine No More Pressed Powder with SPF14 is a light pressed powder perfect for someone who does not like to wear any heavy powder on their face. Its a light weight formula that said to help control shine and keep your fresh all day long. Gives you matte finish and sun protection. It contains oil control ingredient such as tea tree oil complex that helps to absorb excess oil. It is oil free and Dermatologist tested. Comes in 3 shade which is the lightest are in Soft Bisque, follow by a yellow tone shade that is Natural and the darkest shade they have is Almond. 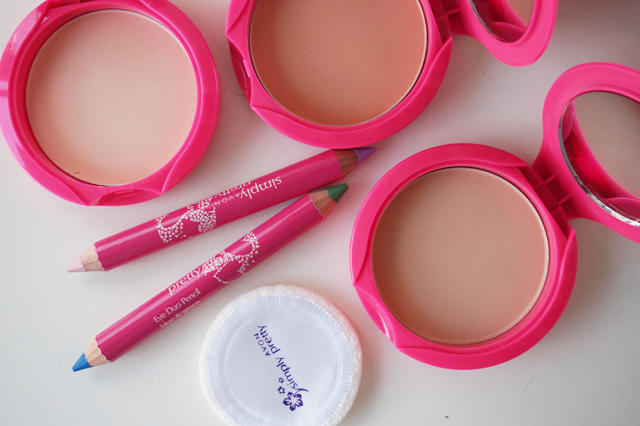 This pressed powder comes with a pretty pink case with a semi sponge pad for easy application. Four different shade to suits your glam look need. In the Fall in Love collection. It is the Eyes On Me ColorBliss Lipstick. 4 bright shades from pinks to reds for you to choose from. 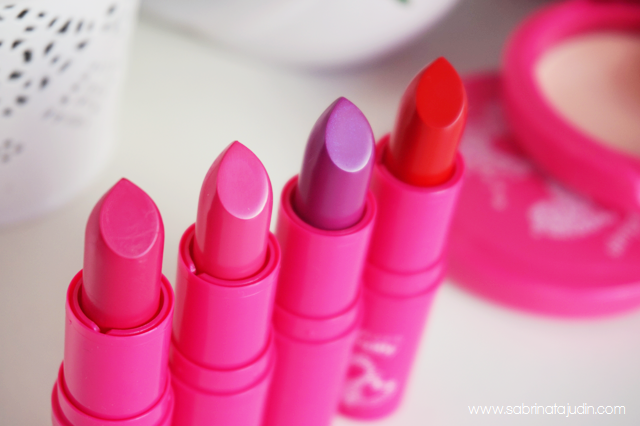 From left to right are EMCBO1 Irresistible Raspberry ( a bright pink with a purple undertone ), EMCBO2 Lovely Pink ( Cool tone barbie pink) , EMCBO3 Glamorous Cranberry ( a dark plumish pink) and lastly EMCBO5 Charming Red ( classic red color). The pigmentation is sheer to medium. Builable and moisturizing. The last item in this collection is their duo end eye pencil. You can use it as an eyeliner or simple an eyeshadow. Features a pastel bright color that would give you eye a little pop of color for that special occasion. It glides pretty smooth and very pigmented. Its a big type of pencil so you have to sharpen it with a big hole type of sharpener to keep it sharp. Here is my look using AVON Simply Pretty Fall in Love Collection. 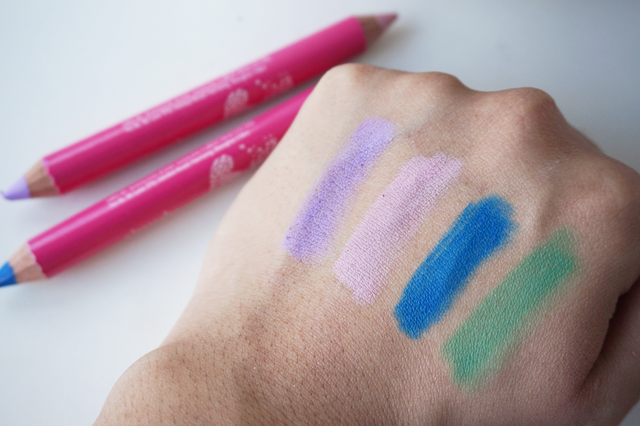 I use the purple & pink eye pencil on my entire lid and bottom lid. Lining my bottom lid with the blue pencil too. I look dark in this picture I use the Natural pressed powder surprisinly its too dark for me. I also use 2 shade of lipstick in this look. Combining both EMCBO2 Lovely Pink & EMCBO3 Glamorous Cranberry.